The first two dishes of our Saturday night meal this week were from an episode of America’s Test Kitchen we watched Thursday night. We built off of that to pull the rest of the line up together. I found this recipe in the “Cookbook and Owner’s Manual” for my slow cooker. Combine the first 12 ingredients (basically everything except the pork chops) in the bowl of a food processor. Pulse until you have a well blended, course, paste. Coat both sides of each pork chop with the paste and layer them in the slow cooker. Cover and set the slow cooker on low. Cook for ~8 hours. I rotated the chops about half way through so that the chops that started out on top moved to the bottom. Remove the chops from the slow cooker. The meat will most likely fall off the bones when you remove them from the pot. Don’t worry about it. Cover with foil and allow to rest for 5-10 minutes. Pour the “juice” through a strainer into a gravy separator and let sit for 5 minutes. Pour the “juice” into a gravy boat or 2 cup glass measuring cup and call it sauce. You might want to check the flavor before serving. Mine was fine but I could see it coming out salty or bland. I finally got around to trying out a new crock pot I received for my birthday oh so many months ago. It worked really well. I asked one of the young ladies who comes to dinner what she wanted to have this week and she said apple sauce. So here’s a menu with apple sauce. Posted on April 7, 2012 by Ted B.
Hello, world – all the Afterlife Cafe posts you’ve seen so far were from my trusty sidekick Bob — occasionally you’ll see a reference to “Ted” or “we”. I’m Ted. 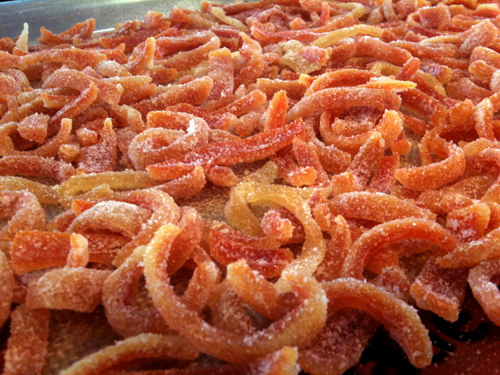 I made a whole mess of candied tangelo peel today for hot cross buns. I usually candy tangerine peels and thought I’d give tangelos a whirl – they have sturdier peels which makes this a bit easier. These last a long time in an airtight container in the freezer – I just finished a slightly stale batch that was still usable from December 2010. Start with the whole peels of 8 tangelos, torn in pieces as large as possible. Put the tangelo peels in a saucepan and cover with cold water. Bring to a boil, then simmer over very low heat until the white part of the peels scrapes off easily without the whole peel disintegrating – took me about 35 minutes but it depends how low you keep the heat, so check them often. Drain the peels and let them cool 10 minutes. Carefully scrape off the white part of the peels with a spoon and discard it. Back in the saucepan, bring this to a full boil, and carefully add the tangelo peels. Simmer this over very low heat for about 45 minutes, stirring occasionally. With a small amount of that pound of sugar, dust a half-sheet lined with a silicone mat. Drain the peels. I haven’t figured out a great use for the syrup yet… maybe poaching fruit? Quickly lay the peels out on the dusted silicone mat, using tongs to spread them out so they are touching as little as possible. Let them cool to room temperature, about 10 minutes. Dust the peels with a bit more sugar to make them easier to handle, then transfer them to the large bowl and complete dust the peels with sugar, packing down slightly so that no sticky parts remain exposed. I usually let them dry for another hour, then store them in an airtight container in the freezer until I’m ready to use them. You can eat these like candy, chop them up and put them in hot cross buns or other breads, top cakes with them, and lots of other things I’m sure. Tomorrow I’ll put some in a cherry glaze to serve with ham.